Neighbours in Sadsun-Yaripora knew Ummer Fayaz Parray, 23, was a doctor in the Indian Army. The family hadn't told them that he was a Lieutenant, lest its connotation as a combatant endanger his life. But in the end, the camouflage hardly served the purpose. Parray was killed by militants nevertheless, picked up from his cousin's wedding on Tuesday evening and shot dead at some distance from his house. His body was recovered from Hermain Chowk in Shopian two hours later. It bore two bullet marks. The family hadn't informed the Army or the police about the abduction, secure in the knowledge that he would be let off with a warning to give up his job in the Army. They spent two tense hours expecting his return, only to receive his bullet-riddled body. 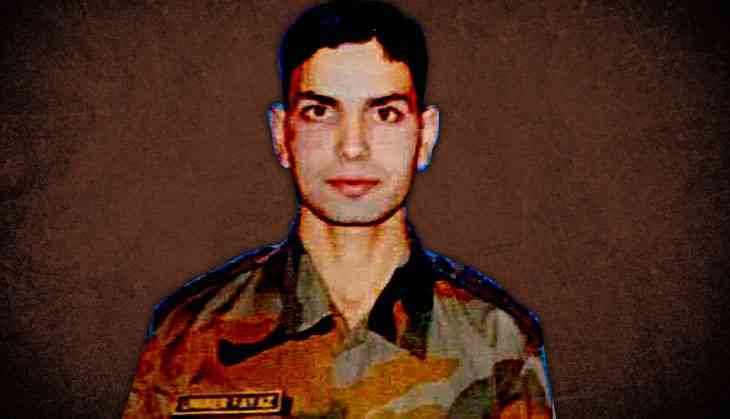 The only son of Fayaz Ahmad Parray, a fruit merchant, Lt Parray had qualified the National Defence Academy (NDA) examination in 2012 after passing Class XII the same year from the Jawahar Navodaya Vidyalaya in Anantnag. Incidentally, he was also a student of the Army Goodwill School at Pahalgam, and of the conservative Salafi High School, Yaripora, where he had studied up to Class V.
At the NDA, Parray was part of the hockey team, and also excelled as a volleyball player, according to Army officials. He was due to go for the Young Officers' Course in September for his elevation as a platoon and company commander. However, Parray's fatal mistake was returning to his home at a time when the situation in the Valley is taking a turn for worse. The support for militancy is at an all-time high. Funerals of slain militants attract thousands of mourners, and invariably become the scene for cathartic anti-India sloganeering. Similarly, whenever there are encounters, people rush to help the militants escape, undeterred by the security cordon. Around 15 people have lost their lives in such attempts over the past year. What's more, from an average of 150 militants per year over the past several years, the militancy has suddenly jumped to around 250, with South Kashmir as its hub. From a little more than 15 militants, the number in South Kashmir, according to a security estimate, has gone up to around 104. However, the police officer added, the militancy was still not as big a problem as in the 1990s, when around 10,000 of them roamed the Valley and the Muslim-dominated parts of Jammu. The killing of Lt Parray has posed a serious new challenge to the security establishment, coming as it does in the wake of the indiscriminate attacks on local police personnel, including nocturnal raids on their families. Such attacks, security experts say, are geared to force the migration of the security personnel and their families from the militancy-infested countryside. Already, Director-General of Police, SP Vaid, is on record to have advised J&K police personnel from South Kashmir not to visit their families. Now, with the killing of Parray, the security agencies have a reason to go into panic mode. This has made every security personnel and his family in South Kashmir vulnerable, creating an urgent need for the government to relocate them to safer areas. Though Vaid had earlier warned militants that they too had their families, Parray's killing demonstrates that this has not deterred them. Many more attacks have followed since, with militants showing little consideration for the personnel not being in direct combatant role. The latest instance was the killing of the five J&K Police personnel and the two J&K Bank guards accompanying a cash van in Kulgam. Not only security personnel, the militants have also killed political workers and sympathisers. In March, militants shot dead a sarpanch, identified as Fayaz Ahmed, a resident of Kakapora of Pulwama district. He was associated with the ruling Peoples Democratic Party (PDP). In April, militants shot dead Imtiyaz Ahmad Khan, a public prosecutor of Pinjoora, at his residence in Shopian. According to the police, three gunmen barged into the house and shot him dead. This was followed by the killing of the PDP district president for Pulwama, Abdul Gani Dar. In Parray's killing, too, militants so far have enjoyed a lot of support from the people. It almost seems as though there's mass revulsion at anything perceived as Indian or close to India in Kashmir. Some reports emerged that stones were pelted at the funeral procession, but these were later denied by reporters on the ground, such as NDTV's Nazir Masoodi. Nevertheless, such wilful killings frame the grim situation that is fast taking shape, as the Army vows retribution for Parray's killing. The Centre has refused to reach out to the Valley politically until the situation returns to normal. But considering the incremental deterioration in the situation, it is likely to be a long time before even a semblance of calm is restored. Are Kapil Mishra's allegations, L-G's hostility part of BJP plan to fix AAP? READ NEXT >> Are Kapil Mishra's allegations, L-G's hostility part of BJP plan to fix AAP?